Camshaft adjuster pre-tensioning tool 1 – No.T10172. Camshaft adjuster pre-tensioning tool 2 – No.T10172/2. Camshaft locking tool x 2 – No.T40133. Crankshaft locking pin – No.T40069. Crankshaft pulley alignment tool – No.T40058. Timing chain tensioner locking pin – No.T40071. Ensure camshafts correctly aligned  . Threaded holes in camshafts point upwards. If not, turn crankshaft 360°. Turn crankshaft in direction of rotation until threaded holes in camshafts point upwards  . Install crankshaft locking pin  . Tighten to 20 Nm. Fit camshaft locking tools  . Tighten to 25 Nm. If camshaft locking tool cannot be fitted valve timing is incorrect. 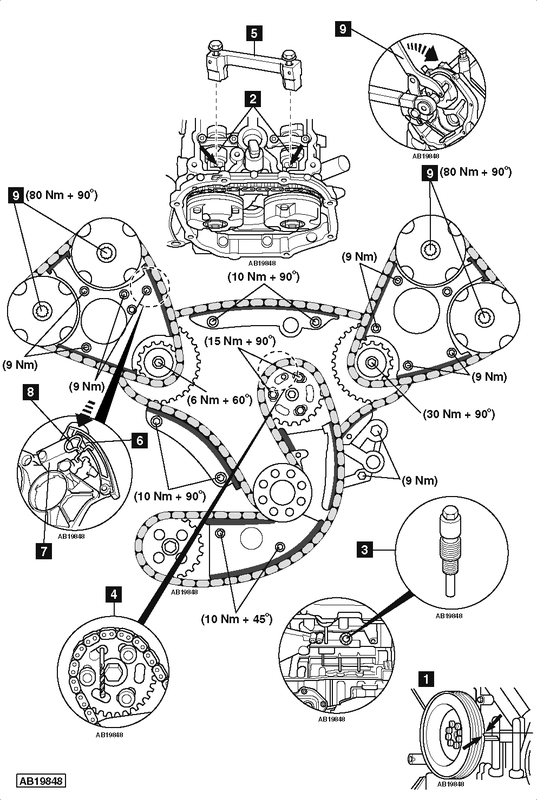 Remove tensioner(s) to ease timing chain(s) removal/installation. Push plunger  into tensioner housing  and insert locking pin  . NOTE: Mark chain link and camshaft adjusters with paint before removal. Slacken central bolt of each camshaft adjuster 1 turn  . Tighten bolt of each camshaft adjuster. Tightening torque: 80 Nm + 90°. Remove timing chain tensioner locking pins after repairs  . Remove crankshaft locking pin and camshaft locking tools  &  . Refit blanking plug and tighten to 14 Nm. NOTE: If timing chains are to be reused, mark LH and RH chains before removal to ensure they are refitted in their original positions.